Adenoids are a mass of lymphoid tissue situated posterior to the nasal cavity (nasopharynx) where the nose blends into the throat. Tonsils (palatine tonsils) are a mass of lymphoepithelial tissue and are located on either side of the back of the throat. Unlike adenoids which are too high up, tonsils are easily visible in the back of the throat. How do Tonsils and Adenoids affect us? Tonsils which remain active for long, Adenoids usually shrink after about age 5 and practically disappear by the teenage years. ﻿﻿﻿Enlarged tonsils: The main symptoms are sore throat, dry cough, pain on swallowing and fever. The tonsils will look inflamed, red and may have flecks of pus. Enlarged Adenoids: The main symptoms are nasal stuffiness, discharge and obstruction. Since enlarged adenoids block the passage of air from the nose, children experience difficulty in breathing, will breathe with their mouth open, may snore at night and experience disturbed sleep. Why Surgery should be Avoided? Tonsils and adenoids may be considered as the first line of defense against infection entering through the mouth and nose. Removal of the tonsils and adenoids may resolve immediate discomfort. However, your susceptibility to catch colds and throat infections does not reduce. A poor immune response to allergens, viruses and infection may continue to exist even after surgery. Research shows that removal of tonsils and adenoids does not impact future immunity. However, the reason for repeated attacks is poor immunity. Therefore, improving this immune response is crucial in saving the tonsils and adenoids. If your immune response is boosted there would be no need for their removal. Specialized homeopathic treatments based on an individual’s signs and symptoms does help in boosting immune responses, lowering recurrent infection and susceptibility to allergens, as well as preventing surgery in most cases. For 6-8 months our child suffered from recurrent bouts of cough, nasal obstruction and discharge, chronic colds, and pronounced breathing from the mouth when asleep. It was evident that the child had some form of difficulty in breathing and were concerned as he was inattentive and sleepy during the day. His performance in school too was lacking and were very concerned. On seeing his family physician we were advised for an Xray which revealed that he had sever adenoiditis and his airway passage was blocked by more than 60%. The pediatrician immediately asked us to undergo surgery as the medicines he has prescribed such as nasal sprays and some tablets weren't having any significant effect. This is when we were referred to Dr. Anish Vaknalli who gave us a lot of hope and asked us to abstain from all other treatments except his homeopathic medicines. On starting the homeopathy treatment Shivan responded by 20-30 percent in the first month. By the fourth month Shivan was completely free of his problem and never needed his sprays or allopathic medicines which he was so dependent on. Honestly, I never expected him to improve so soon as Dr. Vaknalli had mentioned that he may need treatment for up to a year. Not aware that I needed to continue the medicines we stopped the course as we were travelling to our native place. Nevertheless, it has been more than a year now and Shivan is completely free of this problem and his Xrays too confirmed the same. Over the past 25 years countless cases have been referred and treated at HomeoConsult RD. Our medicines are purely Homeopathic, prepared from natural sources, and capable of curing without the harsh side effects commonly encountered with conventional medicine. 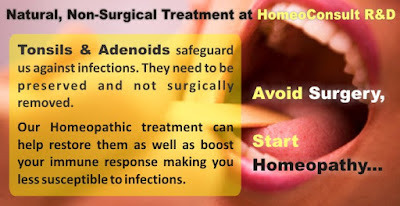 ﻿On starting this treatment patients with Adenoids first experience a reduction in nasal obstruction and stuffiness, and those with enlarged Tonsils a reduction in the soreness and pain, proceeding to improved tolerance to environmental factors and allergens. Over time the medicines are capable of reducing their size and preventing relapses.